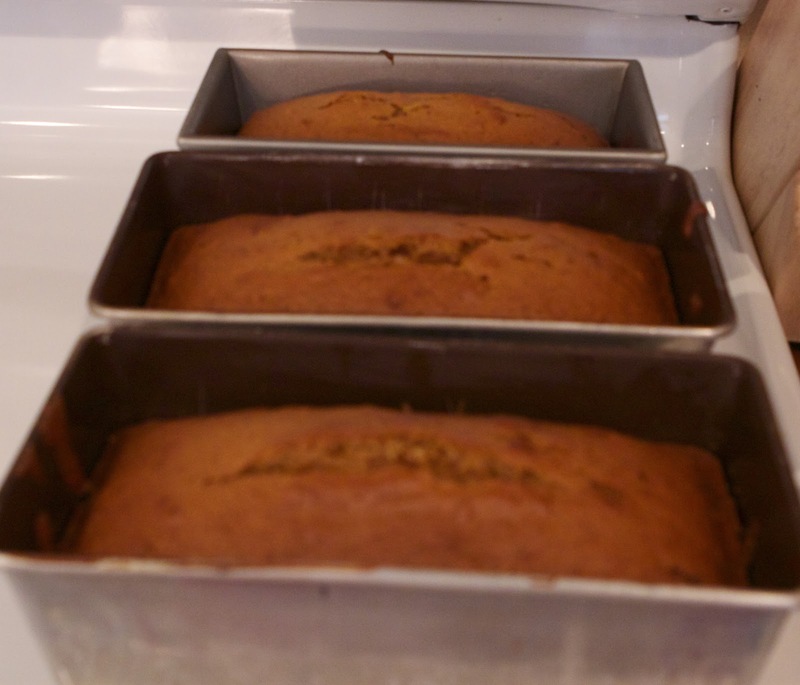 It was only a couple of weeks ago that I posted a pumpkin muffin recipe but I can't let the fall months go by without sharing this yummy pumpkin bread recipe. It bakes up moist and sweet with a great flavor combination of fall spices. A small amount of work goes into making this bread and it yields three loaves. It isn't quite as healthy as the other pumpkin recipe I shared as this one calls for a fair amount of sugar. We like to eat it as a late morning snack or even dessert. Prep Ahead Plan: I am a little bit of a weekend warrior when it comes to baking because I can't seem to fit it in during the week. I always double and triple ingredient amounts, making multiple batches to make sure my time has been well spent! Prepping ahead and freezing baked goods is a great way to serve home baked goodness on busy weekdays! After the breads have cooled, I slice one and store it in an air tight container for snacking that week. After slicing the other two loaves, I wrap the slices individually in plastic wrap and freeze them in storage bags. It takes about 15 extra minutes to do this but it's so worth it. The wrapped, frozen slices defrost very quickly on the counter or when microwaved on the defrost setting for about 45 seconds. Copyright © PrepAhead and Dine In: Pumpkin Bread-3 loaf recipe. All Rights Reserved.